Carbon dioxide and global climate change are largely invisible, and the prevailing imagery of climate change is often remote (such as ice floes melting) or abstract and scientific (charts and global temperature maps). Using dramatic visual imagery, such as 3D visualizations of future landscapes, community mapping, and iconic photographs, the book Visualizing Climate Change demonstrates new ways to make carbon and climate change visible where we care the most, in our own backyards and local communities. Extensive color imagery explains how climate change works where we live, and reveals how we often conceal, misinterpret, or overlook the evidence of climate change impacts and our carbon usage that causes them. 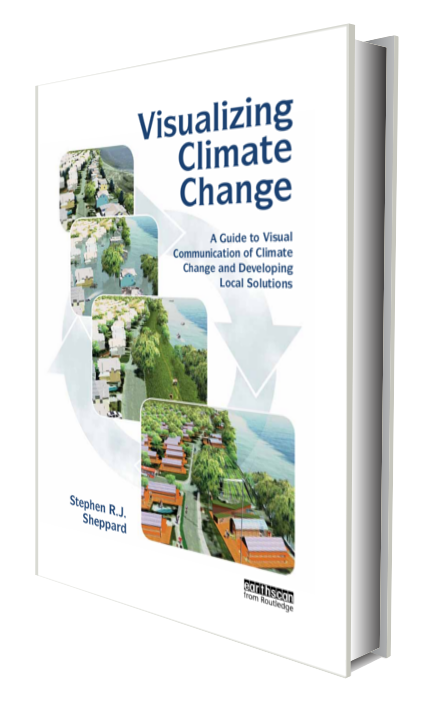 Using visual media in communicating climate change, the book vividly brings to life both the science and the practical solutions for climate change, such as local renewable energy options and flood protection measures. It introduces powerful new visual tools (from outdoor signs to video-games) for communities, action groups, planners, and other experts to use in engaging the public, building awareness and accelerating action on the world’s greatest crisis. You can purchase the book on on the Routledge website or on Amazon. If you have any additional questions please email us at book[at]visualizingclimatechange[dot]org.